Sport Forty seconds is all it took. With a final crunch the block fell, and Grafton's Chris Owen raised his fist to the crowd a newly crowned world champion. 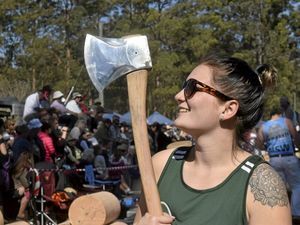 Sport WORLD champion lumberjacks have descended on Grafton for the town's 150th anniversary show. Sport THE Australian Stihl Timbersports Series is about to give woodchoppers unprecedented exposure in Australia and sharpening his axe blade is Chris Owen.